Product Use: Various within modelling and pattern making industries. Hazard Statement: (This material safety data sheet (MSDS) has been prepared in compliance with the Federal OSHA Hazard Communication Standard 29 CFR 910.1200) This product in not considered to be a hazardous chemical under that standard. Our material is made of an eco-composite material without volatile organic compound. 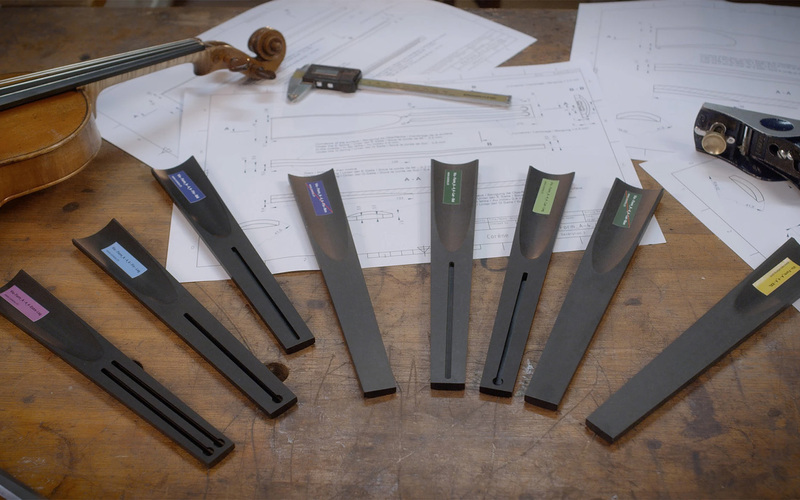 Neo-Ebene fingerboards are currently for violin, viola, cello and bass and come in a variety of thickness and weight variations to fit both new instruments and older restorations. The C dimensions are the amount of a scoop or camber on the edge and on the top of the fingerboard. The Corene™ fingerboards are designed for stringed instruments such as violin, viola, cello and bass. The principle of our range is the same for each instrument. The weight of the fingerboard, in direction of lightness. It is obtained by working on the glue notch, the depth and length of the recess and the overall thickness of the fingerboard. The ability to offer a small material over-thickness, in order to have a little room to adapt the fingerboard to the specific geometry of each instrument. The goal is to provide some variants which will fit as close as possible to each particular need and will allow the best compromise between the support given by the geometrical accuracy of our product and the need for over-thickness required to adapt the fingerboard to the instrument. Both under and upper surfaces of the fingerboard are already finished with high precision and according to the variant chosen, both flanks are straight or already curved. 1.Is it possible to work the fingerboards Corene™ with a conventional plane? The material is very pleasant to work with. Its consistency ressembles ebony but has the advantage of not having veins and it is completely homogeneous. The upper and lower surfaces of the fingerboards are relatively soft, the sides are a little harder to work with. A very sharp plane should be used; especially for cello and double-bass fingerboards. 2.Why is it not possible to stick fingerboards with regular skin glue? The material used is completely sealed and is not porous; it is, in fact, this feature that makes it so resistant to moisture and sweat of the fingers and hand. However, this absence of porosity is the reason why the adhesive of traditional skin glue cannot penetrate and thus adhesion is not adequate. It is essential to use the glue we provide with the fingerboards, which enables complete adhesion of the materials on the neck of the violin. The glue we offer has existed for centuries; it is used in many field of handicrafts. 3.What version of your fingerboard should I use if the neck of my violin is a little warped? Our range is specifically adapted to provide a solution for different types of violin making. The “Fin” series has the final dimensions and should be used for a very straight neck and where the volume of material to be removed for adjustment is low or non-existent. When the neck is a little warped and/or if neck surface is not perfectly flat, we recommend the use of the “Lar” series which has exactly the same upper surface, but has less excess allowance on both sides and under the sole, enabling greater adjustment. If the fingerboard needs even more adjustment, we sugggest the “XXL” series, providing a larger excess allowance and thus enabling adjustment to suit every situation. 4.Is it possible to plane the surface of the "Extra-Light" fingerboard? This weight gain is obtained by a partial cavity in the interior of the fingerboard, carved inside the glue notches. The thickness of material on this fingerboard’s top is only 2 mm, but due to the good resistance of the material, not as much planing is needed as with ebony. If more material for planing is desired, we recommend the “Final-Standard” or “Large-Standard” series. 5.What is the wear and tear of the surface of the fingerboards? We have a great deal of experience in the wear and tear of our fingerboards and we are very attentive to this aspect of the quality of our products. Because each musician uses his instrument differently – more or less often and intensely – it is difficult to judge the lifespan of a fingerboard. As a rule of thumb, our experience shows that a fingerboard used 4 hours a day by a top musician shows no sign of wear and tear after a year of use. 6.Is it possible to buy tailormade fingerboards? In principle, our range is expected to provide a solution for every situation. Our manufacturing processes require very specific equipment, prepared for the shapes and dimensions we produce. However, if a customized variant is requested, we would need to evaluate the cost, depending on the number required. We would have to consider whether special production is warranted. We would be very happy to bring a solution to your needs; so the simplest would be to contact us. 7.What is the surface finish of the fingerboard when I receive it? When you receive your fingerboard, it is packed in a PE plastic bag (recyclable) that protects a polished surface like a dull mirror. 8.Is it possible to view the fingerboards blueprints? Each different version of the fingerboard blueprints is available on our website in pdf format. 9.Is it possible to obtain a REACH certificate of the material used to make fingerboards? Actually, the European regulations stipulate that all hazardous materials imported into Europe must have a REACH certificate, unless they are not dangerous. And for our raw material, the REACH certificate is not required. 10.Why are the ranges for viola, cello and bass not as large as for the violin? All variants are available for all four instruments (violins, viola, cello and bass), but the stock availability is adjusted to demand. If you would like to order an option that is not available in our online store, please send a request by e-mail and we will have it produced immediately; it will of course take a little longer than parts available from stock (Approx. 2 months). Available for violin, viola, and cello in several sizes.